While the effective date of the revisions to New Jersey’s statute on alimony was September 14, 2014, the impact that those changes will have on the way alimony works in New Jersey is only starting to become clear as New Jersey courts decide cases according to the new law. One question that has repeatedly come up among litigants and family law attorneys is the manner in which alimony can be modified when a paying spouse retires. In an unpublished case recently decided by Ocean County Superior Court Judge Lawrence Jones, titled Mueller v. Mueller, the court was presented with a request to modify alimony based on the payor’s retirement. Although the opinion was not published, and thus does not have precedential effect on future court decisions, it does offer lawyers and future litigants an opportunity to see what other courts might consider in ruling on a similar request. The couple in Mueller v. Mueller had divorced in 2006 after 20 years of marriage. In their marital settlement agreement, the husband had agreed to pay the wife $300 per week in alimony, but the agreement didn’t explain what would happen when the husband retired. Now 57, the husband came before Judge Jones to request an order saying that his obligation to pay alimony will terminate when he turns 62 and retires, at which time he’ll be qualified to receive his full pension benefit. The wife requested an order denying this motion. The court noted that, under the new additions to New Jersey’s statute on terminating or modifying alimony, specifically at N.J.S.A. 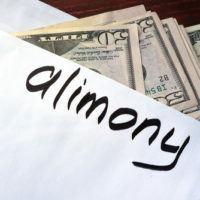 2A:34-23(j)(1)-(3), there are three different standards for whether alimony should terminate when the paying spouse reaches “full retirement age” and qualifies to collect benefits under Social Security, depending on when the spouses reached a final judgment of divorce that ordered alimony. When the judgment occurred prior to September of 2014, this termination or modification isn’t automatic; rather, the court will also consider the receiving spouse’s ability to have saved for retirement, as well as six other factors under the statute regarding such issues as whether it is standard to retire at that age for someone in the payor’s industry, and whether the payor would be able to continue paying after retirement. If the judgment of divorce occurred after September of 2014, the termination would be automatic when the paying spouse reaches retirement, unless the receiving spouse can prove why alimony shouldn’t terminate. Finally, one section of the law addresses early retirement occurring prior to reaching “full retirement age” under federal law, which requires the retiree to prove to the court with additional evidence that their retirement is “reasonable and made in good faith” if they wish their alimony obligation to terminate. The law also allows for a paying spouse to ask for an order terminating alimony prospectively, so as to be able to know all financial obligations and plan whether or not he or she will be able to retire at that time. The law does not state how far in advance the paying spouse may request an order prospectively terminating their alimony obligation. In the case before Judge Jones, the husband was both retiring early and requesting a prospective termination. The husband had stated to the court that he will have reached his maximum pension benefit by the age of 62, which is a factor under the law that the court will weigh in favor of terminating alimony. In his opinion, Judge Jones reasoned that, when granting a request to prospectively terminate alimony, the court should do so only “when (a) the prospective retirement will take place in the near future, rather than many years after the actual application, and (b) the applicant presents a specifically detailed, proposed plan for an actual retirement, as opposed to a non-specific, general desire to someday retire.” Such a plan should discuss how the retiree will financially support him or herself. In this case, the judge determined that he would be unable to accurately evaluate the important financial considerations involved in granting such an order so far in advance of the payor’s retirement. The judge noted that reaching an age at which retirement is appropriate is only the beginning of an analysis of whether terminating alimony is appropriate, and courts cannot guess about what will happen in intervening years when an order to terminate is requested so far in advance. The judge suggested that the payor in this case instead come before the court 12 to 18 months prior to the date he plans to retire with additional evidence regarding his post-retirement financial plan. If you are seeking a modification or termination of your alimony or child support obligation in New Jersey, or need legal assistance with another matter before the Family Part, contact Union family law attorney John B. D’Alessandro for a consultation, at 908-964-0102.